Stocks hold their gains for a whole day -- is it good enough for a real turnaround? 139 Swing Signals -- 139 BUY signals and not one SELL signal. 32 Trend Leaders, all in strong up-trends according to Aroon, MACD and DMI. We have 21 stocks that are new additions to the list and 6 that fell off the previous list. 69 Trend Busters, of which 65 are BUY signals and 4 are SELL signals. 115 Gap Signals -- stocks with upside or downside gaps or gaps that have been closed. 66 are bearish gaps and 49 are bullish gaps. Stocks started the day strongly and finished with a further last minute rally. The result is another set of bullish signals at Alert HQ. We again have unusual proportions of BUY signals. The Swing Signals list is has no SELL signals and the Trend Busters list has only 4 SELL signals. The Trend Leaders list has increased in number though it stays at a historically low level. Downside gaps slightly outnumber upside gaps. 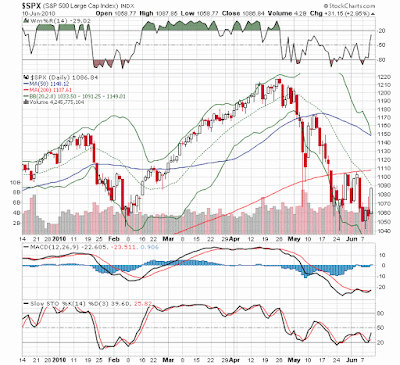 So our signals are swinging strongly bullish but is there confirmation seen in some of the major indexes. The S&P 500 is below and you can see that the short term indicators are all showing a recovery underway. Williams %R, Slow Stochastics and MACD are all showing reversal to the upside. Unfortunately, not every indicator on this chart is bullish. SPX is still slightly below its 20-day moving average and significantly below its 200-day and 50-day moving averages. The overall outlook then is that follow-through is required. As long as SPX stays below that 200-DMA, it's best to exercise caution. Check out our signals but do your own research and be sure you are getting a bargain if you choose to be a buyer.